Travis picked out my engagement and wedding rings all by himself. I told him that I wanted a diamond (as opposed to a gemstone) but he did the rest. I’ll be honest – even though I loved it, it wasn’t what I would’ve picked. I had visions of a princess-cut diamond on a plain band for the engagement ring, and an eternity band for the wedding ring. 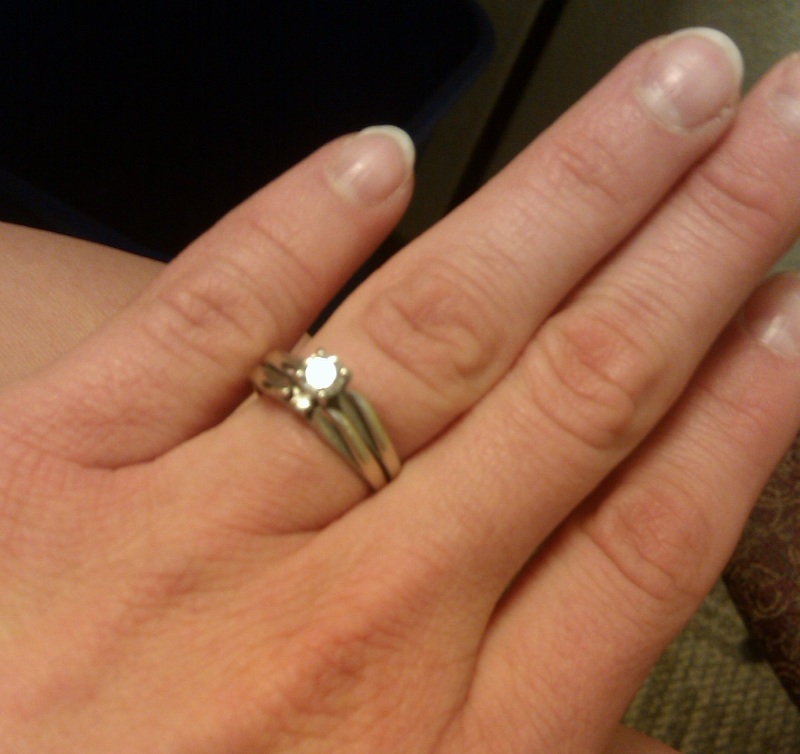 Travis actually bought my engagement and wedding rings together because the wedding ring is a ‘shadow band’. It looks exactly like the engagement ring, only smaller. Travis told me after we were engaged that he thought about giving me the wedding ring (with the smaller diamond) first as a joke, but then realized it probably wouldn’t be funny. (Good call.) And to this day, the cost of my rings is a secret. 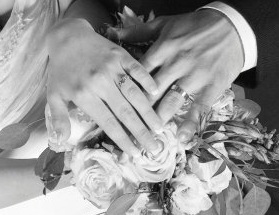 We bought Travis’ wedding ring from the same jeweler (white gold, very plain band) and had our wedding date engraved on the inside of our rings (I figured that would give Travis an easy way to remember the date! just kidding). We also got ring cleaner solution with a handy little dipper thing – I could just put my rings (which I got soldered together) onto the dipper thing, plunge it into the liquid, let it sit for 5-10 minutes, and voila! good as new. Well, the first month we lived in Boulder, I ended up dumping that solution out all over our bathroom. I’ve looked for the same thing at Walmart and such stores but I’m pretty sure I’d have to go to a real jewelry store to get it (and actually, I think I have done that but they didn’t have the same thing). The jeweler that Travis bought the rings from will do free cleanings but they’re a local jeweler so no dice when we moved to Colorado. 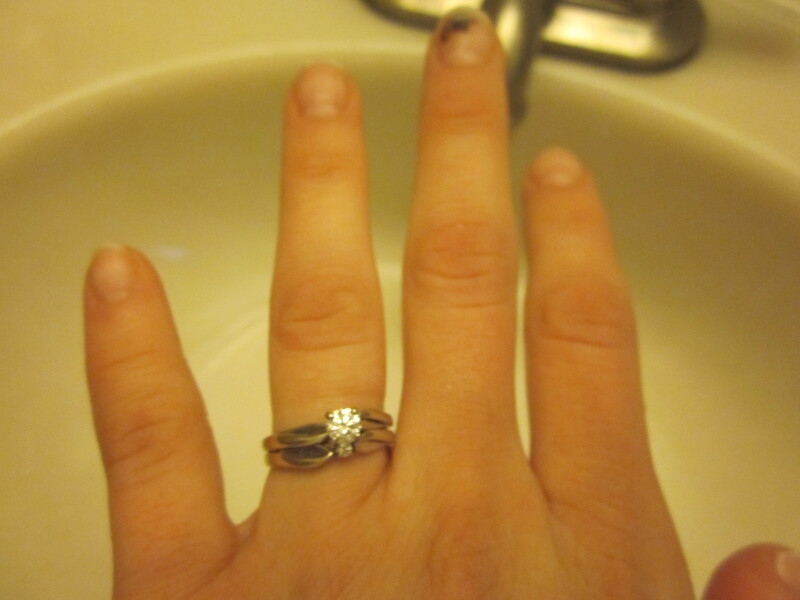 With the design of my ring especially, it needs to be cleaned every couple of months, bare minimum. So what’s a girl who spilled her ring cleaning solution to do? All of my old toothbrushes (before I got an electric one) became ring cleaning brushes. 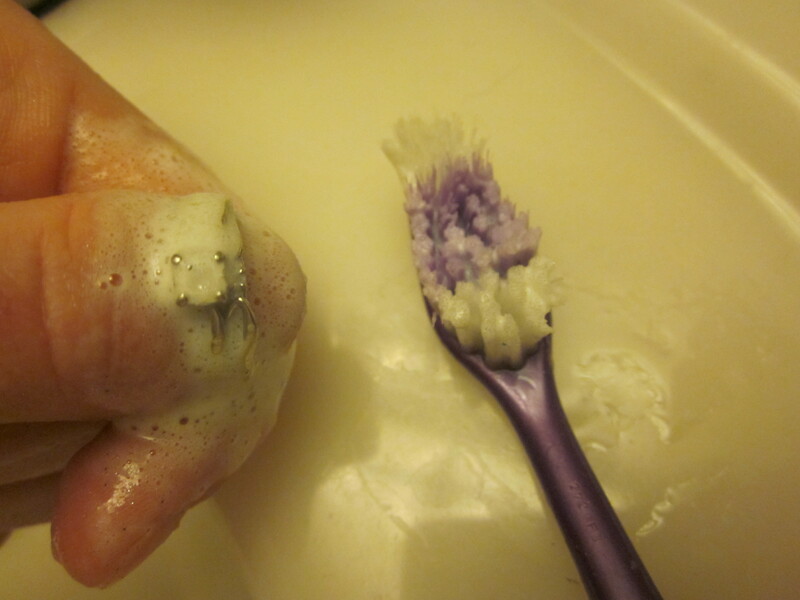 The toothbrushes work great for getting into the nooks and crannies of my ring and around the diamond, and the toothpaste makes the diamond sparkle like new. 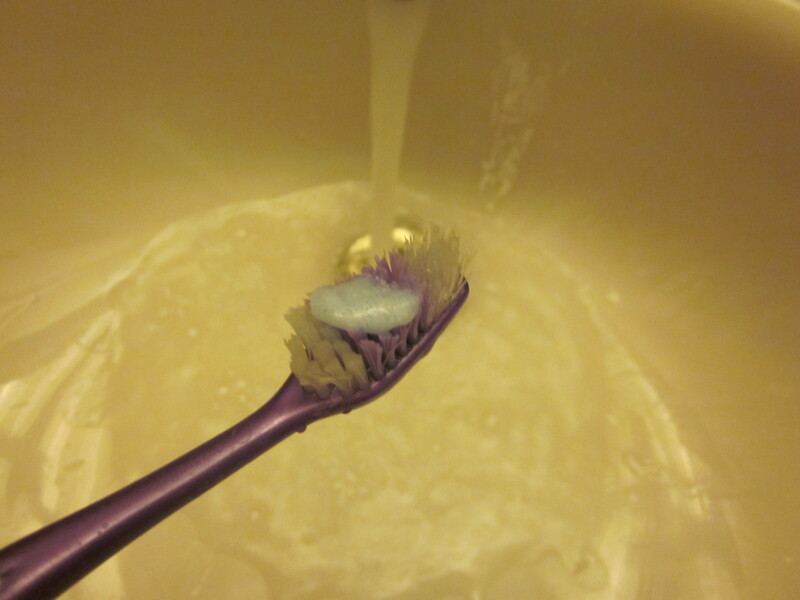 Put a little bit of toothpaste on your toothbrush, add a little warm water and brush away. Then rinse it with warm/hot water, dry it and voila! Good as new. How do you clean your jewelry?